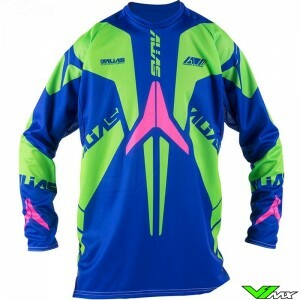 Alias motocross jerseys can be ordered easy and fast at V1mx for the lowest price. With the mx gear from the American company you are sure of top quality equipment. The 2016 collection Alias jerseys consists of the following lines: A1, A2 and the A2 Youth. The improved fit increases the ergonomic of the jersey in combination with a body protector. On top of that will the use of moisture wicking materials give you a comfortable ride. A lot of different designs and color combinations are available which will look good for a long time due to the 100% non-fade sublimated polyester. The high-grade materials make sure it won’t shrink. Finally, the jerseys are provided with a new sleeve construction called Raglan. Are you looking for a full gear set? At V1mx you can buy motocross pants, motocross jerseys and optionally gloves for a very competitive price.